Team FanTEStic, led by Ravena Jazmine Kavi Rao, came in second. 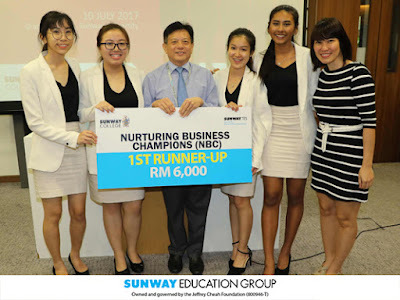 Ravena, together with her team members Lee Suen, Clarissa Foo Xin Syuen and Tay Hui Zhen, developed “Wow! Kit” a cosmetic product which consists of “Wow! Liner”, a pencil eyeliner with iron powder and “Wow! Lashes”, a lash band made of magnetic sheet, enabling consumers to apply eyelashes without the need to use any form of glue. 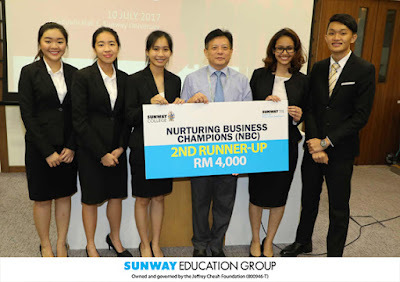 The all-girl team took away the first runner-up prize, winning themselves RM6,000 cash. Team FanTEStic took home first runner-up. 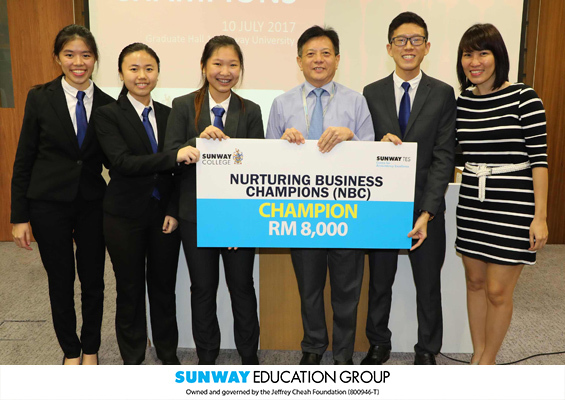 From left: Tay Hui Zhen, Clarissa Foo Xin Syuen, Teo Ee Sing, Lee Suen, Ravena Jazmine A/P Kavi Rao and Kwong Lai Cheng, lecturer of SunwayTES CAE. Goh Zhou Sheann, Ng Zhi Qian, Ng Han Qi, Melaine Mok Zi Qing and Nurin Syahirah Ishma Osman of team DIA came in second runner-up, taking home RM4,000 cash. Led by Goh, the team developed and presented their business proposal on a smart wallet device named DIA, which offers its users with cash-flow auto detector that works closely with an application that comes with the device. Team Vib!, Champion of the NBC 2017. From left: Jessica Ngan Keh Jinn, Low Sindy, Tey Hsien Chyi, Teo Ee Sing, Jack Ng Wei Lun, Kwong Lai Cheng, lecturer of SunwayTES CAE. In addition, 10 teams received awards for being the best in class for the preliminary round. The competition which aims to help develop students’ skills in effective communication, emotional intelligence and critical thinking, saw a total of 305 students from Diploma in Professional Accounting, Certified Accounting Technician (CAT), and Certificate in Finance Accounting and Business (CFAB) taking part in the preliminary round, with the top 5 teams successfully advancing to the final round.